If your business has geographic markets with high concentrations of customers, it may make sense to get closer to regional carriers in these markets. Carriers and 3PLs who specialize in regional transportation are uniquely equipped to support your supply chain in the areas of the country most important to your business. 1. Regional carriers offer greater flexibility. The quicker, shorter routes of regional carriers mean greater opportunity for your load to be included in the existing infrastructure — and included quickly — as early as next-day. It also puts less pressure on you to meet stringent pick-up and delivery windows like those set by national carriers, who have much more ground to cover and, therefore, little-to-no wiggle room with time. 2. Regional carriers have better driver retention rates. In the current capacity pinch, there simply aren’t enough drivers to meet the load demand. Regional carriers retain drivers at a higher rate because routes tend to be out and back in a day, allowing drivers to sleep at home. It also offers predictability in routes, customers, and scheduling — all major advantages in attracting and retaining drivers. 3. Regional carriers provide optimal customer service. With regional service, the same truck drivers routinely handle the same routes and visit the same customers. Drivers are therefore able to get to know the customers — and vice versa. Because of this familiarity, regional carriers execute drops more efficiently and customer service and satisfaction levels tend to be greater. 4. Regional carriers can offer rate discounts. As regional companies tend to deal with more predictable freight volumes along the same routes, they’re able to build cost-saving efficiencies into their network. For instance, if your freight carrier knows they are going to get a regular flow of freight in the same lane, they can market backhauls and build out the network – a mutually-beneficial arrangement that can save you money. 5. Regional carriers let you leverage load consolidation. Often, regional runs involve regular deliveries to the same retailer drop points. If the carrier has other customer loads moving to the same retailers, it can consolidate these shipments and you pay only your share of a full truckload shipment — a much cheaper option than LTL. Regional trucking companies fill the space between smaller local carriers and the huge national lines. They offer bigger capabilities and reach than the local companies, with a more personal level of service than national carriers. Because of this personal service, you’re able to establish a closer relationship with the carrier — a true partnership built on understanding of your business, your customers, and your capacity needs. 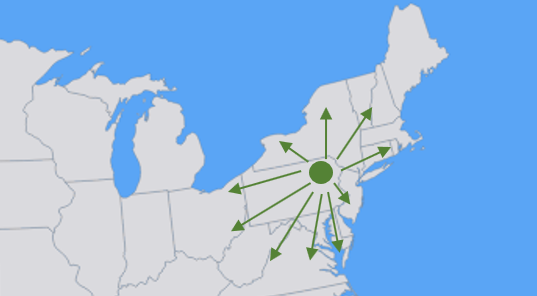 KANE’s regional transportation services serve the Northeast part of the country. To learn how we can align our capabilities with your operational needs in this key region, contact us today.